Voicing refers to the presence or absence of vocal vibration during speech sound production. In a voiced sound, there is vocal fold vibration and an audible 'buzzing' sound. In an unvoiced sound, there is no vocal fold vibration. Compare the first consonant in thimble (represented by /θ/ with the first sound in this (represented by /ð/). Again, try placing your finger and thumb on your throat whilst producing the sound. In thimble the consonant /θ/ is unvoiced because there is an absence of vocal fold vibration. In this, the consonant /ð/ is voiced because there is a presence of vocal fold vibration. Now take the following pairs of phonemes (you may need to look at your copy of the phonetic alphabet). In each pair, one sound is voiced and one sound is unvoiced. Which is which? Bilabial consonants are produced at the lips (e.g. /b/). Labio-dental consonants are produced with the lower lip and the upper teeth (e.g. /f/). Dental consonants are produced when the tongue is placed between the teeth (e.g. /θ/, /ð/). Alveolar consonants are produced with the tip of the tongue and the alveolar ridge (the hard, bony ridge behind the teeth) (e.g. /s/). Post-alveolar sounds are produced with the tip of the tongue and the roof of the mouth (specifically, the area in between the alveolar ridge and the soft palate). (e.g. /ʃ/, /ʒ/). Palatal sounds are produced between the tongue and the hard palate (e.g. /j/). Velar sounds are produced between the back of the tongue and the velum (e.g. /k/, /g/). So far we have said that consonants can be defined by (1) their voicing, and (2) their place of articulation. Our final level of classification is to do with the manner or process of articulation. This is related to the degree of closure (complete closure → close approximation → open approximation). Plosives involve a complete closure, where the vocal articulators fully meet and air flow is stopped. This creates the 'explosion' of sound when the closure is released, hence the name 'plosive'. The plosive sounds in English are: /p b t d k g/. Fricatives involve a close approximation, where the vocal articulators do not fully meet and air flow is forced through a narrow passage. This creates the friction sound, hence the name 'fricative'. The fricative sounds in English are: /f v s z θ ð ʃ ʒ/. 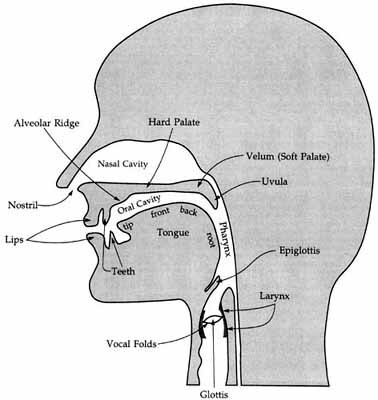 Approximants involve an open approximation, where the vocal articulators are still close but not enough to create friction. The approximant sounds in English are: /j r w/. Nasal sounds are produced by air coming out through the nose and mouth. The nasal sounds in English are /m n ŋ/. The table below shows us the three ways of defining vowel sounds. For each cell, voiceless sounds are on the left, and voiced sounds are on the right. The columns show the place of articulation and the rows show the manner of articulation. So, we can use the table and work out that /s/ is a voiceless alveolar fricative!